North Carolina’s governor has announced that Interstate 95 has been reopened to all traffic within the state. A storm in the eastern Atlantic has been downgraded from a tropical storm to a tropical depression. The National Hurricane Center said Sunday at 11 p.m. that Tropical Depression Kirk has weakened and now has maximum sustained winds of 35 mph (55 kph) and is moving west at 25 mph (41 kph). It is located about 835 miles (1,345 kilometers) southwest of the Cabo Verde Islands. Forecasters say Kirk could weaken into a trough of low pressure Monday or Tuesday as it continues to rapidly move westward. Meanwhile, Subtropical Storm Leslie is expected to dissipate in a few days. It is located about 1,245 miles (2,005 kilometers) west of the Azores and has maximum sustained winds of 40 mph (65 kph). There are no coastal watches or warnings in effect for either Kirk or Leslie. 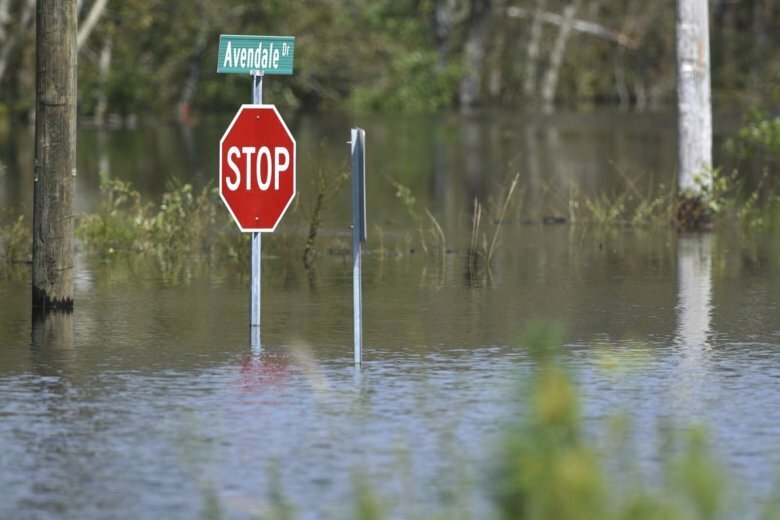 North Carolina’s governor says travel remains treacherous in parts of southeastern North Carolina even as floodwaters start to recede in some areas of his state. Gov. Roy Cooper released a statement Sunday evening saying people should remain aware of the dangers in still-flooded areas. He says “Florence continues to bring misery to North Carolina,” adding crews were still rescuing people who had driven into floodwaters over the weekend. He says teams have conducted about 350 rescues most recently and that more than 5,200 people have been rescued since Florence slammed into the Carolinas on Sept. 14 as a hurricane. He also says more than 3,700 people had to be evacuated. Now he says authorities are focusing on going door to door and conducting wellness checks on those in flooded areas. Forecasters say Subtropical Storm Leslie, newly formed in the North Atlantic, is expected to dissipate in a few days. But the National Hurricane Center says it’s keeping watch on Tropical Storm Kirk, now speeding westward across tropical Atlantic waters. At 5 p.m. Sunday, the hurricane center reported, Leslie was about 1,170 miles (1,885 kilometers) west of the Azores and moving west at 3 mph (6 kph). There are no coastal watches or warnings in effect from that storm, which packs top sustained winds of 40 mph (65 kph). Meanwhile, Kirk was moving at a fast 23 mph (37 kph) westward across the Tropical Atlantic. The storm was centered about 645 miles (1,040 kilometers) southwest of the southernmost Cabo Verde Islands. Some strengthening is expected in coming days, but forecasters say Kirk is likely to begin weakening later in the week. Congress is starting to consider almost $1.7 billion in new money to aid recovery efforts from Florence. The chairman of the House Appropriations Committee says the money would be available as grants to states to help rebuild housing and public works, and assist businesses as they recover from the storm. GOP Rep. Rodney Frelinghuysen of New Jersey says it’s “a first round” and that lawmakers are ready to act quickly if the federal disaster relief agency also needs more money. About 6,000 to 8,000 people are being told they should prepare to evacuate because of anticipated flooding from rivers in a coastal South Carolina county. Georgetown County spokeswoman Jackie Broach-Akers says Sunday that a “record event” of up to 10 feet (3 meters) of flooding is expected because of heavy rains dumped earlier by Hurricane Florence. The flooding is expected to start Tuesday near parts of the Pee Dee and Waccamaw rivers. Broach-Akers says people in the potential flood zones should plan to leave their homes Monday. Georgetown County is opening two shelters for those who evacuate. Schools in Georgetown County are closed until further notice. A woman who took in more than two dozen dogs and cats during Hurricane Florence has been charged with practicing veterinary medicine without a license. Tammie Hedges, founder of Crazy’s Claws N Paws animal rescue, was arrested Friday after 27 dogs and cats were confiscated from a temporary shelter. Hedges said she gave amoxicillin to some sick animals and also used a topical antibiotic ointment. She’s also charged with soliciting a donation of tramadol, a prescription painkiller sometimes used for dogs and cats. At least three of North Carolina’s wild horse herds on the Outer Banks have survived Hurricane Florence, but caretakers are still trying to account for one herd living on a hard-hit barrier island. The News & Observer reports that the condition of the Shackleford Banks Herd was still unknown Sunday. The president of the nonprofit Foundation for Shackleford Horses said the uninhabited island is still inaccessible, so it has been impossible to survey the entire herd of 118 horses. She said about 30 horses have been spotted so far and all appeared to be healthy. The Carolla, Rachel Carson Reserve and Cedar Island horse herds weathered the storm fine. Staff members are planning to make trips to the island this week to check on the Shackleford Banks herd. Forecasters say Subtropical Storm Leslie has formed in the north Atlantic, far from land. The National Hurricane Center in Miami said Sunday morning that Leslie is expected to be short-lived. Leslie is about 1,145 miles (1,840 kilometers) west-southwest of the Azores and has winds of 40 mph (65 kph). The storm is moving 3 mph (5 kph), and little motion is expected in the next two days. Farther southeast, Tropical Storm Kirk is moving quickly west across the eastern Atlantic and is expected to pick up speed in the next few days. Forecasters say Kirk is about 545 miles (875 kilometers) southwest of the Cabo Verde Islands. The storm has maximum sustained winds of 40 mph (65 kph) and is moving west at 21 mph (34 kph). Forecasters think the storm will move even faster though Tuesday. Kirk is expected to strengthen for a few days and then weaken toward the end of the week. Images on social media show masses of dead fish rotting on a North Carolina interstate after floodwaters from Hurricane Florence receded. State Department of Transportation road maintenance supervisor Jeff Garrett posted photos Saturday of the rotting fish scattered along a stretch of Interstate 40. More than a week after Florence hit, travel remains difficult in the eastern part of the state. Officials say counties in eastern North Carolina continue to see major flooding more than a week after Hurricane Florence made landfall. Gov. Roy Cooper said Saturday that nine of the state’s river gauges are at major flood stage and four others are at moderate stage. The Cape Fear river is expected to crest Sunday and remain at flood stage through early next week. Emergency management officials said residents whose homes were damaged or destroyed will begin moving into hotel rooms next week. South Carolina also has ordered more evacuations as rivers continue to rise in the aftermath of a storm that has claimed at least 43 lives.